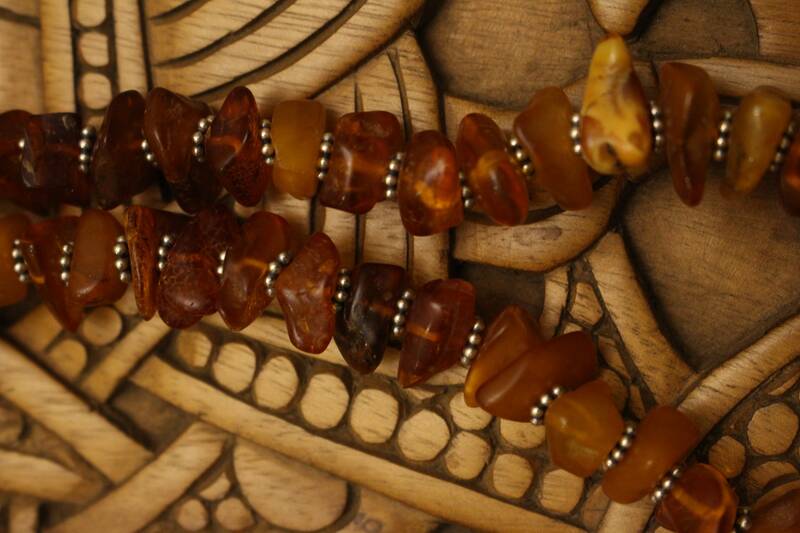 Baltic Amber Necklace with Silver Bead and Spacers. This stunning necklace is comprised of genuine naturally formed Baltic amber pieces, each spaced with small detail sterling silver beads and features one large embellished and hand-granulated sterling silver bead! Each dot of granulation is hand placed on this central bead, creating a completely unique texture pattern. This was an ancient technique coveted by the Norse, and in our replica beads is created only through the craftsmanship of practiced silversmiths in Sweden. Please message me at any time if you have any questions! This piece was created in affiliation with Viking Kristall. 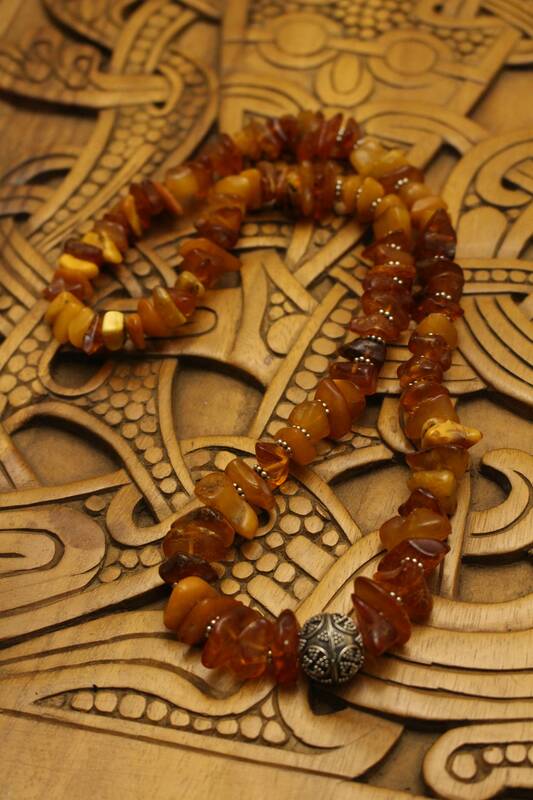 An obsession with amber has existed in Northern Europe since prehistory. It has been revered for its mystical beauty and has been thought to contain healing properties, amongst other powers. All amber formed around 44 to 46 million years ago from compressed tree resin (and sometimes contains leaves or animal inclusions as a result). If you’ve held amber, you know it is warm to the touch and softer than other gemstones. It’s no wonder the ancients worshipped and aligned themselves with such a unique substance. 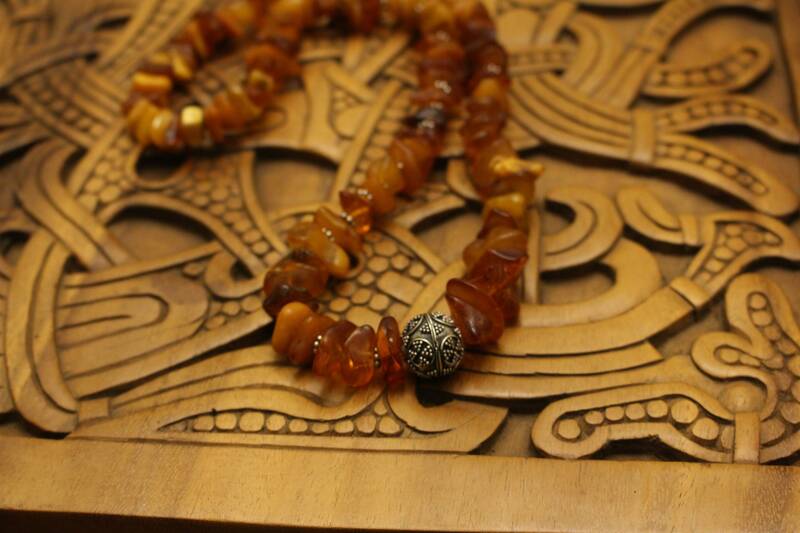 Widely traded and worn from the Neolithic era to the common era, amber possesses the beauty of the sunlight. It comes in all colors: opaque yellow, green, red, black, and of course (most commonly) a golden hue. 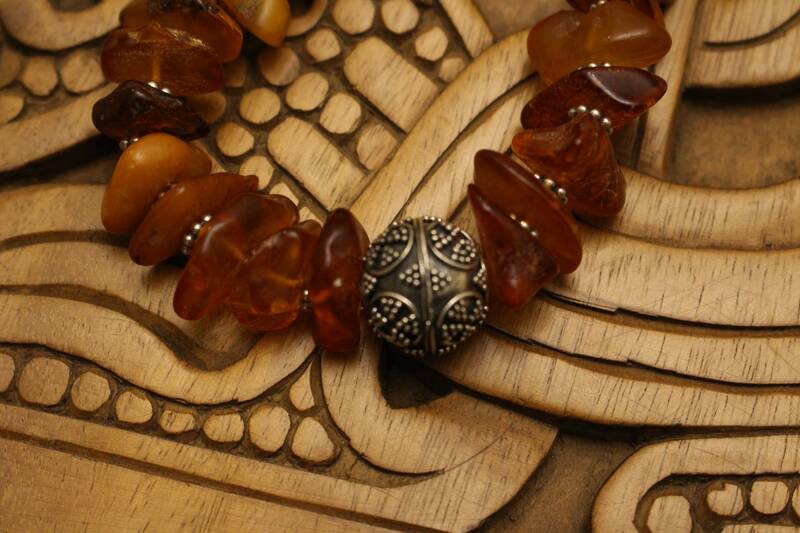 In ancient times, beads, amulets, rings, and even game pieces were made out of amber. Not unlike our ancestors, it is most often worn as jewelry today! All of our amber is mined and collected in the Baltic (as the Vikings did). Each piece is natural, unique, and holds its own magical beauty!